After a week hiatus, I'm back on the Physique57 program! Since I missed a full week of training & P57 workouts, I decided to repeat my last full week of both. Which meant yesterday was not a run day, but rather a P57 day! I completed the 30 minute express workout, & followed it up with the arms & ab booster. Luckily I was smart enough to follow the beginner moves, that way I could compensate for the neck & back pains. Yesterday, Ideeli featured an ECI sale...if you're in the market for summer dresses, this brand is great. It's one of my "go to's" for dresses. Nordstrom carries this line & I've never had an issue with the quality of the dress. 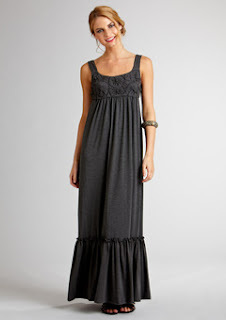 How do you feel about maxi dresses? If you had to pick 1 of the 4 shoes below, which would you pick? These are all Naughty Monkey brand shoes. Remember that video I was soliciting for y'all to vote for??? Well I took 3rd place in the contest, which means I won a free pair of shoes. These are my choices. All from their summer / spring lines. They may be a bit over the top for a few of you out there...Matteo wasn't crazy about any of them...I on the other hand, totally like them. So after viewing each of them on various shoe sites - since they offer 360* views & convincing Matteo that I won't emberrass him when I wear them; I've made my choice! I still want to know which you would choose though. LOVE Maxi dresses! Super comfy for hot days!